In two-possession games this season, the Huskers are 2-8. In some games, it has been a sloppy first quarter, others a strong first but sloppy second, others a strong fourth but nothing good before, others a strong three quarters and a rough fourth. There’s not a ton of consistency for head coach Amy Williams’ squad this season. They’ve lost at least two in a row four times and won at least two in a row three times. Which, to be fair, might be the only consistent thing. The Huskers were once again hot and cold Sunday afternoon against Indiana. The Hoosiers shot 25 percent from the field in the first quarter and struggled to work their way inside on the Huskers, and then 31 percent in the fourth quarter, but they shot 62 percent in the second and third. Nebraska dropped down by as many as 12 in the third quarter, a hole that proved too deep to climb out of, and lost 82-78 to the Hoosiers to fall to 10-12 on the year and 5-6 in conference play. Nebraska started strong on the defensive end of the floor to open things. Indiana turned it over on each of their first four possessions and struggled to generate anything inside against center Kate Cain. The Hoosiers were out-rebounded, effectively kept off the free throw line and outscored 12-4 in the paint over the first 10 minutes. Offense throughout the first half (and the game for that matter) wasn’t much of an issue. NU shot 41 percent in the first quarter and jumped to 50 percent in the second. Guard Hannah Whitish paced NU with 11 points early as she carried over her hot 3-point shooting from the Huskers’ last outing, and Nebraska got scoring from five others in the first half. The second-quarter defense was the issue. Indiana got rolling with a 24-point frame on 11-of-15 shooting and then carried the same offensive rhythm into the third quarter for another 24-point frame. In a 3-point game with less than 30 seconds to play, sophomore wing Taylor Kissinger had a wide-open look that would have tied things up at 81-all. She came up short but Nebraska got the ball back. Whitish (who finished with 16 points) drew a foul and went to the free throw line with eight seconds left. And Nebraska lost by four. 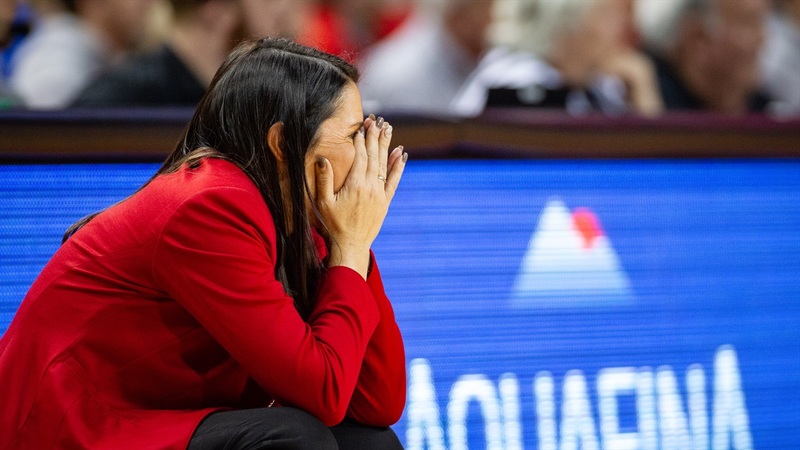 The final minute will most likely get the attention from the outside, but inside the Huskers’ locker room after the game, the focus was on the middle quarters. “I think this game, what really did it was getting down by 12 points in the third quarter,” senior forward Maddie Simon (12 points and seven boards off the bench) said. “We played well down the stretch, it’s just hard when you dig yourself that hole. We’ve made some plays offensively to keep us in close games but it just comes down to defense and getting some stops. Haiby led the way for Nebraska with 17 points on 5-of-8 shooting. She didn’t attempt a single three in the game. “Just staying aggressive and attacking the hoop,” she said of what allowed her to have success. That was the gameplan, too. The Hoosiers came into the day with the best 3-point defense in the Big Ten. There was a very noticeable effort to get the ball inside to Cain and to have the perimeter players either attack the cup off the dribble or cut toward the basket when they didn’t have the ball. The Huskers shot 44 percent from the field and outscored Indiana 42-34 in the paint. That accomplished a goal. They just didn’t hold up on the other end. Next chance will be Thursday when Nebraska travels to Ann Arbor for a 6 p.m. CT game against Michigan on BTN.